We’re delighted to announce the publication of our Annual Review for England and Wales 2017/18. It sets out what we delivered for consumers during a year when water companies – and the essential services they provide – faced intense public and political scrutiny. Securing nearly £1.4 million in financial redress for aggrieved customers after handling almost 19,000 complaints and enquiries about water companies. Identifying around £14.5 million in potential annual bill savings for customers through our water meter calculator. Helping about 3,400 low-income consumers identify potential welfare payments totalling more than £9.3 million through our Benefits Calculator. Making sure almost 400,000 low-income households are now receiving lower bills through working with water companies to boost take-up of social tariffs by more than 50 per cent. Helping to secure up to £150 in compensation for customers affected by the disruption to water supplies following the Beast from the East freezing weather. Successfully challenging poor performing water companies and retailers to improve their service and reduce complaints. Championing the interests of small and medium-sized businesses to make sure they do not miss out on the benefits of the retail water market in England. 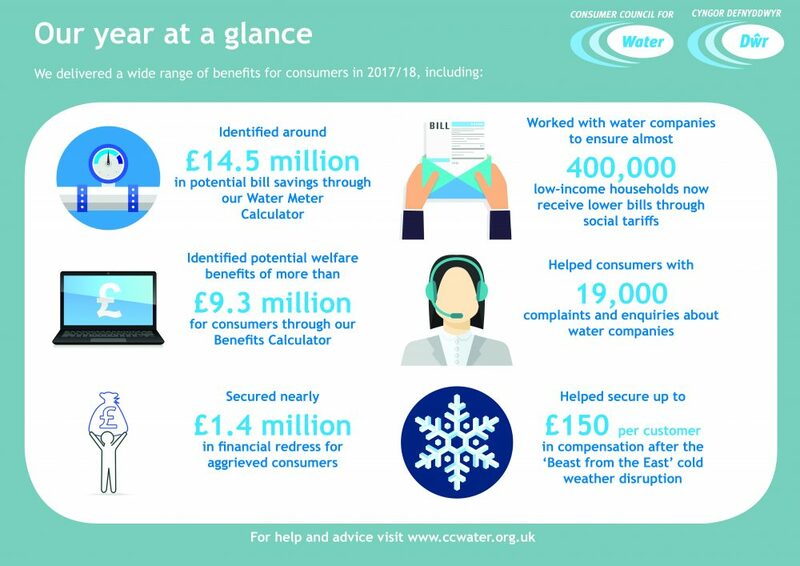 We hope that you enjoy reading about these successes and the many other things we achieved for consumers during 2017/18.